Citroën GSA. 1979–87 (prod. 576,757). 5-door saloon, 5-door estate, 3-door van. F/F, 1129, 1299 cm³ (I4 OHC). Improved GS, with hatchback (five years after Heuliez proposed its version) and plastic bumpers, bringing the look into the 1980s. Even more aerodynamic with front spoiler. Four-wheel independent suspension, five-speed gearbox. Larger engine from GS X3, smaller-engined GSA Spécial from 1981. 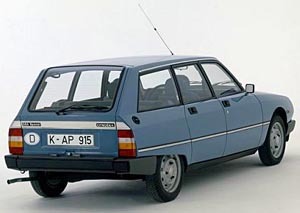 French production to 1983, Spanish production to 1986; Indonesian production of Entreprise van to 1987.